It’s not every day I open a reserve wine. It’s been a tough few days with Mattie (my Airedale) who I rushed to the vet on Wednesday. After a full day of tests and observation, the vet confirmed she had two tumors on her spleen…no choice but to remove the spleen. She had successful surgery on Thursday and gets to come home Saturday morning…can’t wait to go get her! This has been emotionally exhausting for me. The joy of getting past an otherwise devastating event deserved something special. To the cellar I went searching for one of my favorite wines…the Chateau St Jean Reserve Malbec. I found the 2007 in the wine cellar and decided “Yes!”. I worked for CSJ as a wine chemist from 2004-2007…my first wine job. Margo Van Staaveren, winemaker for CSJ, is an exceptional winemaker and an exceptional person. The art of blending is the cornerstone of her winemaking philosophy. One of the things she enjoys most about her job is putting together the final blend for the Reserve wines. “Since no two vintages are alike, it gives us the opportunity to carefully search for the vineyard lots that offer the biggest fruit expression and the ability to age in order to create a wine that truly captures the best of the vintage,” says Margo. She considers the Reserve wines the most concentrated, distinctive and balanced wines made at Chateau St. Jean. 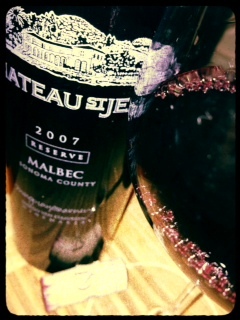 The Chateau St Jean 2007 Reserve Malbec is not your typical Malbec. It’s very fruit forward and big. I mean big. This is a big Malbec. Did I mention that this is a big wine. LOL. On the nose is plum, dark cherry, hint of cola, vanilla and a slight minerality. Yes, I said minerality for a red wine. The palate is a creamy jam of dark ripe cherry, blackberry, cassis, smooth tannins, and nice long finish. Alcohol is 14.6% by volume. I recommend a big juicy grilled hamburger with this wine.